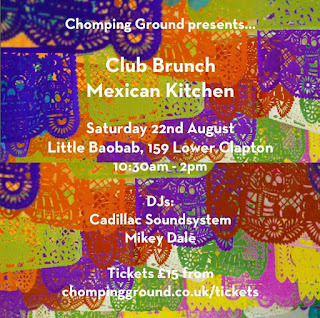 Chomping Ground is back for another Saturday brunch at Little Baobab cafe in Lower Clapton Road, E5, this time taking a Mexican theme. The mouthwatering menu includes fresh watermelon with chilli & lime, and Migas (Mexican scrambled eggs), plus there will be cocktails, DJs and more. ~The fun starts at 10.30am and will go on til 2pm. Tickets cost £15 from here (chompingground.co.uk/tickets), which includes the meal and your choice of breakfast cocktail. Extra cocktails will be available on the day for £4 each and coffees for £2. Tickets will also be available on the door, too. It's basically the next best thing to lying on a beach in Tulum, right? Almost..."